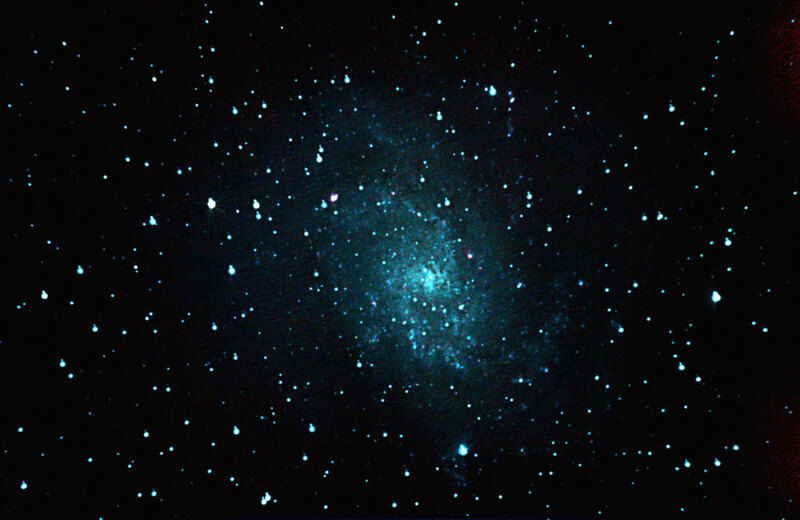 Chris Newsome took this image of The Pinwheel Galaxy in Triangulum on the 24th August 2006. It is a composite of eight 360 second exposures at 400 ASA taken with a Canon EOS 300D camera at the prime focus of a Celestron C8-NGT telescope. This was guided by a Meade DSI camera and a Skywatcher 80T refractor combination via a GPSUB interface controlled by MaximDL. Chris comments: "The position of the galaxy at the time of imaging seemed to be right in a sweet spot for the balance of the scope as there were virtually no tracking errors in Dec or RA and also, by a sheer fluke, I had managed to align the scope fairly accurately with the North Celestial Pole as drift align was almost non existent". The images were calibrated in MaximDL and then processed in CS2 just using curves and RGB levels.